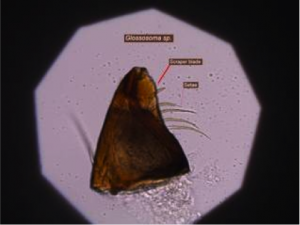 Figure 8.21: Glossosomatid caddisfly larva with stone case. Photo by Rhithron Associates. Scrapers feed primarily on periphyton growing on surfaces of rocks and other substrate. Scrapers, just as the name suggests, scrape the algae and associated material from the surface of rocks and organic materials, literally grazing the material from the rocks. 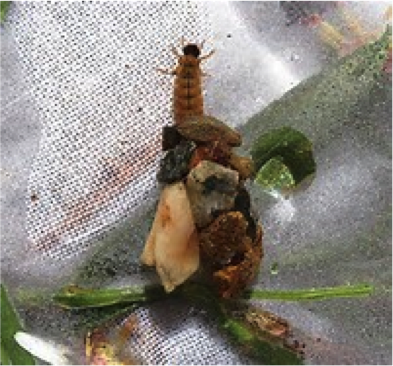 Scrapers typically have mouthparts with special adaptations for grazing from rocks. The scraper blade is flat and located at the edge of the mouthparts. When the scraper blade is placed against the rock and closed, it functions similarly to a sickle, shearing off the algae attached to rocks. Hairs, called setae, are located at the base of the mandible and assist in collecting and directing the sheared material into the mouth. Figure 8.22: The scraper blade of the larva’s mouthpart. Photo by Rhithron Associates.